This was commissioned by the Director of the Brewhouse Arts Centre, Maureen Milgram, to celebrate its third anniversary. 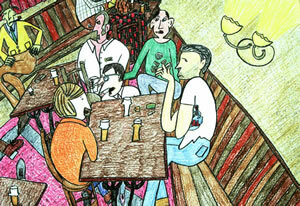 The exhibition was a humorous take on the town and its culture. The mayor commented at the private view that he wished the council had more of a budget for the arts. 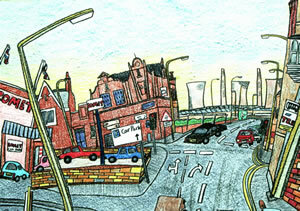 The Council bought a drawing. 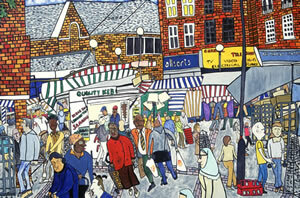 The show was sponsored by West Midlands Arts and BT in the Community. This was the second of two exhibitions of wax pictures and poems staged with the help of Charlie Catling, Arts Officer for Wandsworth Council and grants from Wandsworth Arts. The first was on the theme of 'London', the second of the people of London, hence the title 'Wax Profiles'. 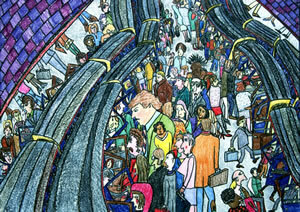 This latter exhibition took place at the Pump House Gallery in Battersea Park. There were thirty seven wax drawings and poems. A mere speck of cosmic dust. The astronomical speed of light. And jackets from the cosmic loom. Four paintings were commissioned by the Hospital Arts Committee for the Out-patients Department, Lanesborough Wing. They were specifically for a large waiting area where patients await a range of medical services. The local subject matter and process were both discussed prior to working and the commission was paid for by the St George’s Improvement Fund. Patients and staff have since commented on them favourably. One patient explained how the images put a smile on her face when she was pregnant and waiting for blood tests. Another commented on how she liked to imagine being within the picture and guessing the lives of those characters painted. The concept was to decorate the newly built ACAD centre with a range of paintings that showed the diversity of the locality. This project was co-ordinated by Candice Hurwitz, Art Director of the trust. 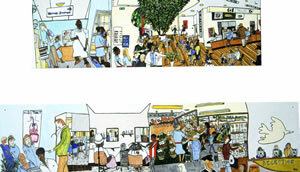 The idea was to create paintings that were of subject matters relevant to the staff and patients that used the hospital. Therefore the intended audience was consulted prior to completing the work, through a range of photographs of the locality. As the hospital was within a catchment area that included a large proportion of ethnic minorities within its population, the representation of this was considered a priority, hence scenes of Ealing Road shops and the Neasden Temple. 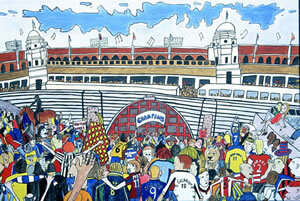 Also due to the imminent demolition and reconstruction of Wembley, a world renowned landmark, it was decided that this should be considered as a subject. In the end six scenes were alloted. The artwork was sponsored privately by CP Plus. The staff showed a lot of interest, and there was a lot of discussion of the final work and locations. The detail within the pictures, the humour and the colour, were particularly appreciated. On Kings Fund Night, the reaction was very favourable, with members of staff telling the artist how they had participated in the process of choosing the images and liked the results. Comments such as: ‘they’re bright and fun, and I know the places’, ‘I like the fact that the artist is self-taught’ and ‘it brightens the place up and some of the patients need it’. Possibly the most flattering response came from several art professionals. One woman who ran a public art course, thought that the paintings fitted well into the context, unlike a lot of artwork she’d seen. This comment was echoed by another hospital arts co-ordinator. The newscaster Martyn Lewis, patron of the ‘Make a Difference’ project which aimed to use artwork to make the hospital a more pleasant environment, was presented to the artist at the opening ceremony. 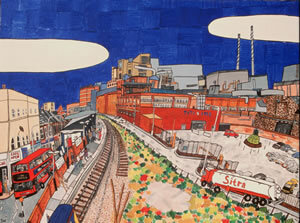 Philip Sutcliffe the Director of the Health Trust liked the paintings so much, he commissioned the artist privately. The project was co-ordinated by Shaun Caton, Art Director of the trust. The Arts Committee wanted a large painting to place outside the operating theatre. Some gentle humour for a traumatic environment. So the artist discussed possible local sites to represent in the painting. Eventually “Hackney Central” focusing on the railway station was the preferred subject. The hospital were so pleased with the painting that they commissioned two more. One of these paintings was for the Ante-Natal clinic waiting room refurbishment, sponsored by the Kings Fund 'Enhancing the Healing Environment Programme'. The other was for Carol Bailey, director of human resources which was used for publicity material. Northwick Park Hospital is geographically isolated, and the purpose of the artwork was to help include it into its own community, but also to celebrate its ‘life’. This project was co-ordinated by Candice Hurwitz, Art Director of the trust. In order to bridge the gap between the internal and external communities the paintings emphasise the similarities between people and places, bringing out the concord between the hospital and Harrow itself. Two highly visible sites were chosen for the paintings that accommodate the interior decor and design of the hospital. 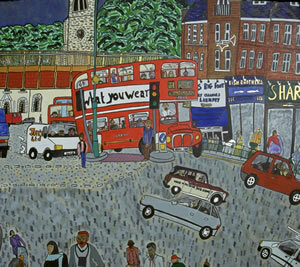 The first painting entitled, ‘Harrow in the Round’ is situated at the Main Entrance. 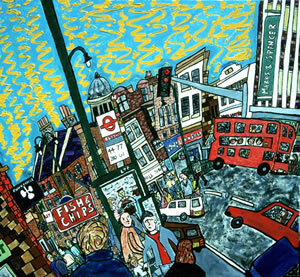 It is a wide-angled and slightly abstract interpretation of Harrow Shopping Centre, with the ‘Katie’ statue by James Butler a central focus. It balances the welcome sign opposite, which is global in content, by its local nature. 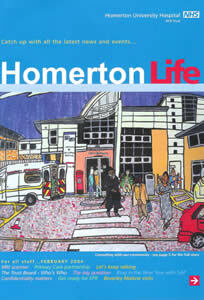 The second painting entitled, ‘Life’ is situated in the Outpatients Department Waiting Area. This narrative reflects the life of the hospital. These two paintings are thin and long (landscape), fitting onto two walls of an alcove, making a feature. This allows a collaged narrative reflecting the life of the hospital, concentrating on the diversity of people and landmarks that make up the community. The project was sponsored by First Management Group. With the help of the Kings Fund, the Maternity Ward was renovated. The hospital wanted bright cheerful paintings to cheer up the women waiting in labour. Paul discussed his ideas with Jane Davies, Deputy Director of Service Development and Modernisation with staff from the maternity ward. 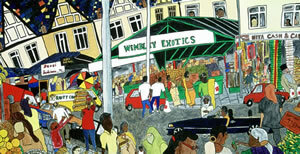 Three paintings were created of Walthamstow market to fit the corridor area outside the delivery suite. Jane Davies remarked that she loved the style of art and thought the paintings were superb. Staff in the ward commented that they liked the brightness and detail of the pictures, which helped create a happier environment. They became a talking point for the hospital. The paintings were so successful that Jane re-commisioned Paul to celebrate the hospital's centenary. This will try to capture the hospital site and environment before the old hospital is demolished to make way for a new one. Due to redevelopment of the hospital and demolition of the old historic buildings to make way for modernisation, the commision was to preserve he memory of the site. The paintings are situated on the Link Bridge that co-joins the two sites. And the Medical Education Centre. Simon Mills, Project Director Whipps Cross Redevelopment explained, 'we wanted some artwork that would capture the history and atmosphere behind the hospital'. Subsequently the images have been used by the NHS trust on cards and literature, especially 'The Magazine' which is the NHS Trust in-house brochure. Hugh Steward, Director of Patient Support and Environment, invited Paul to the hospital Arts Committee in the summer of 2004 to discuss a commission to celebrate Newham, its diverse population and environment. The local/global theme of the project was highlighted and together the group pinpointed the localities in the NHS Trust to represent. These were photograhed and made uo into possible scenes. The 'Panorama of Newham' encapsulated the whole National Health Trust area and recognised landmarks, showing how it is part of the wider London metropolis, a major global city. 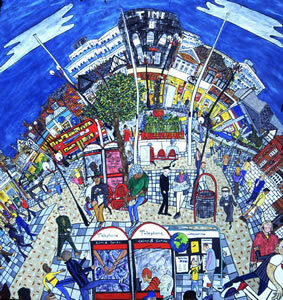 'Green Street' was choosen due to its diversity and cosmopolitan mix of people from around the world, both shoppers and football fans make it a busy area and recognisable. The 'Tate and Lyle' factory is an iconic image due to the company's longevity in the borough and employment of the community. It imports sugar from abroad and exports globally.